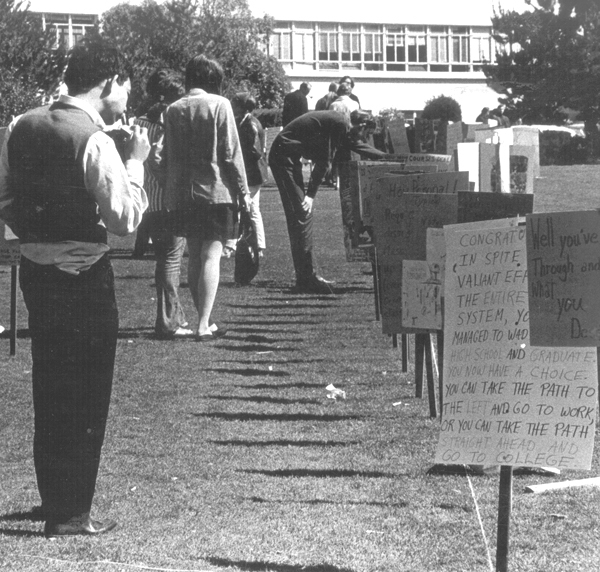 The Americana Game was created by SDS at San Francisco State in April of 1968 (the semester before the student strike for Third World studies) as a way of communicating our dystopian view of American society. Americana Game article in The Movement newspaper. The game was laid out on the central lawn and composed of paths marked by lines of rope on the grass that players walked along. The lines were divided into segments of American life with “Choice” and “Chance” points directing people to different paths. Posted on each path were facts, photo collages, and hand-written commentary signs giving our jaundiced (and, yes, sometimes bitterly angry) view of that segment of life. The commentaries were not sophisticated or arcane political analyses, rather they were the political equivalent of leaflets. But unlike our typical flyers, they used sarcasm and humor instead of slogans and obscure jargon. 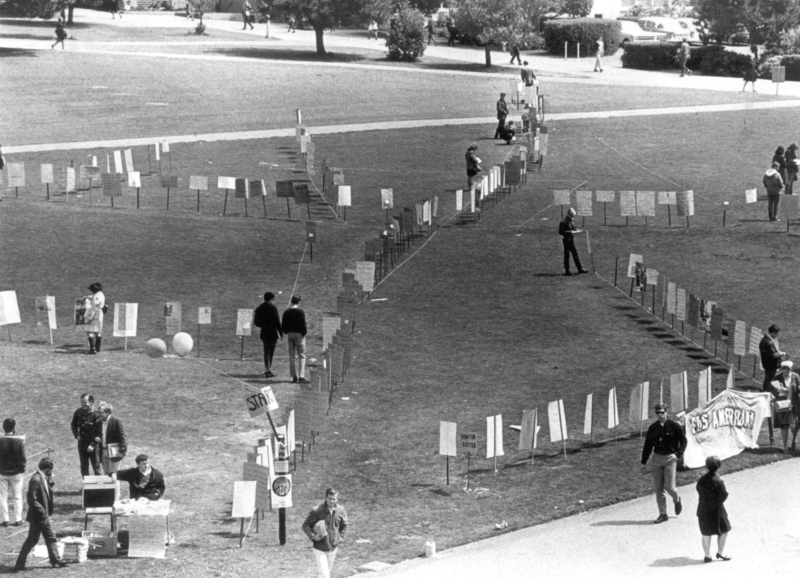 We laid out the game early one morning, and in the two days it was up before the administration tore it down, hundred and hundreds of students played it — walking the lines and reading the signs. It generated a lot of comment and discussion. Some students accused us of presenting an “unbalanced” view of society and failing to be “academically objective.” Charges to which we proudly pled guilty, citing the 1st Amendment right to express strong opinions, and then countering with the class and political biases of the supposedly impartial content of the courses we experienced every day at S.F. State. But perhaps the most lasting effect was on ourselves within SDS — the result of the discussions, debates (okay, knock-down, drag-out arguments) that we went through planning the game, creating the content, and writing the commentary signs.